Despite yesterday’s report, Gegard Mousasi will not be taking on former UFC champ Vitor Belfort at Affliction III. Although Mousasi confirmed the fight immediately following his scrap against Mark Hunt, Belfort appears to have pumped the breaks on it. You can’t really hate on Belfort for feeling the way he does. 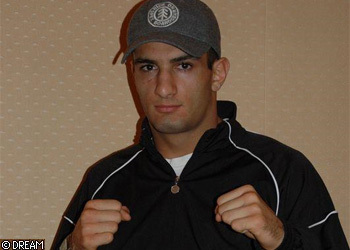 Mousasi put the MMA world on high alert after he captured the Dream Middleweight Grand Prix title. So if Belfort beats him at a different weight class, it belittles the significance of the W.
Since defeating Ronaldo “Jacare” de Souza for the title last September, Mousasi has been all over the map fighting a kickboxing bout, as well as competing in Dream’s highly-publicized Super-Hulk Tourney which jumped off yesterday. Mousasi doesn’t appear to have any hard feelings towards Belfort for not wanting to tango, so he will simply move on to the next challenge, whoever and at whatever weight division that might be.